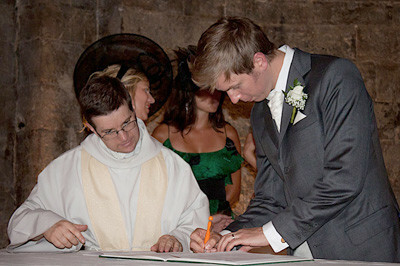 Two photographs from the wedding of a young man who married in the south west of France. It was a summer wedding, so we decided upon a light weight and very fine Super 130?s wool from Thomas Fischer in Huddersfield for this young man’s wedding suit. Hopefully, the first photograph shows the elegance of the slim cut suit and the second photograph the finesse of this excellent Huddersfield cloth. The three button suit was complemented by a brilliant white bespoke shirt and, all put together, made for a sharp looking wedding suit. The suit and cloth chosen also allow for the suit to be worn on future occasions too and will serve as a great suit for many years to come. The cloth was from English wool, with working buttons and horn buttons. 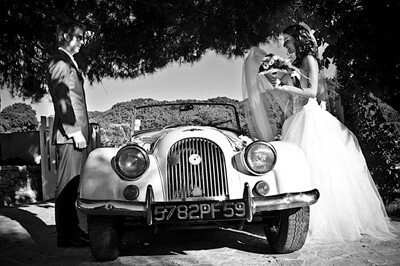 A French Wedding with an Ooh La La Suit! - Bespoke Suits By Savile Row Tailors.